Shack Shine Arrives in Edmonton! Dustin Grainger’s road to business ownership was anything but typical. He worked in nuclear medicine before switching gears and starting a career in engineering technology. Then, he decided to take what he’d learned and apply it to a business of his own. 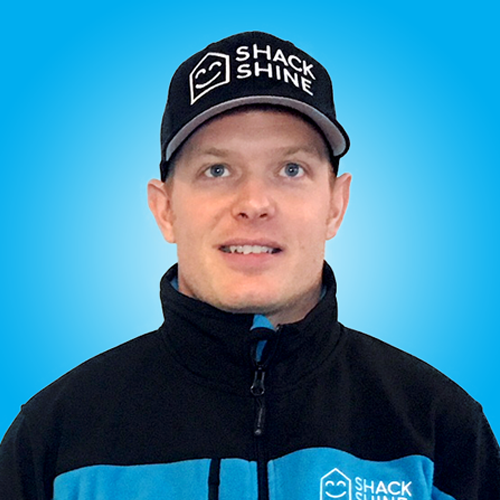 When he found Shack Shine, he knew it was the perfect fit: a fragmented industry ripe for disruption that would give him the new challenge he’d been looking for. We had a chance to chat with Dustin about why he decided to join Shack Shine and what he’s most excited for in his new career as a franchise partner. I chose to join Shack Shine for a few reasons. First, the industry is very fragmented; I knew this was a great opportunity to professionalize this service space and bring it to a new standard. I also loved the branding and the big, bold Mercedes vans and uniforms. Lastly, I loved the company values: passion, integrity, professionalism, and empathy. They aligned with many of my own values so it was a great match. I have a background in Nuclear Medicine and Instrumentation Engineering Technology. Although not directly related, many of the skills transfer over to running a business more than I had anticipated. With Nuclear Medicine, I was able to relate and gain trust with patients as we are injecting radiopharmaceuticals (or radioactive tracers) into a patient. As one can see, you can’t have anyone performing that on you without trust! We would then take images of disease processes and send the images over to radiologists to make a diagnosis. In my career in Instrumentation, I worked for a startup Instrumentation Analyzer company that provided real-time online measurements for midstream oil and gas companies. I’m proud to say I was employee number one and I learned quickly many facets of business, trades, and engineering that has helped me in the transition to becoming a business owner. What are you looking forward to most about being a business owner? There are so many facets of Shack Shine that I look forward to: being part of a great franchise, working outside in the summer on great homes, and mostly, meeting and servicing clients in the Edmonton and surrounding area. I get a lot of satisfaction knowing that we do a great job, and that our customer is happy with the level of service and attention to detail we can provide. Outside of work, I enjoy spending time with my family, skiing and snowboarding in the mountains, golfing, and general renovations around the home. I am actively part of BNI Edmonton. BNI is a business networking group that contains many local businesses. We network and get to know other local business owners so we all can benefit from one another. It is a great way to connect with others and be a part of the business community. The people I look up to the most are other driven, successful people. It is always good to meet hungry, happy, hard-working people in the community. If I had to pick a few people to look up to, it would be Elon Musk for his visionary and out-of-the-box thinking, Sidney Crosby for his constant professionalism and poise under pressure, and Gary Vaynerchuk for his unique realistic views. Edmonton is unique because although it is cold most of the year, it is a very vibrant city in the summer. With festivals operating year round, there is always something to see and do. We have so many green spaces around the city, so there are endless trails and possibilities for exploring. Edmonton is also home to the largest mall in North America, West Edmonton Mall. Fun fact: I was an undefeated chess champion in elementary school and played rugby and football growing up. Lastly, I would like to share that I am excited to get this season going and service our Edmonton clients. My goal is to have one of the best cultures for our team of young technicians and students so they want to keep coming back year after year. Please join us in welcoming Dustin to the Shack Shine family! Interested in joining him? Get more info about starting your own franchise.